Signed into law on January 4th, 2011, the Food Safety Modernization Act (FSMA) was the first major food safety reform to take place since 1938. The goal of FSMA was to focus food safety measures on prevention, rather than emergency response, and it did so by giving the Food and Drug Administration (FDA) the power to create new rules governing the production, handling, and import of the US food supply. In addition to focusing on food safety risks from microbial pathogen contamination (such as Salmonella and E. coli), Congress directed that the new food safety regulations be scale-appropriate, conservation-friendly, and accessible to certified organic and value-added producers. In September, the Food and Drug Administration (FDA) released reproposed sections of the rules that would regulate FSMA. This second round of proposed rules came in response to the food and farming community’s active participation in the FDA’s public comment period last fall. Many of the comments and asks of FMC members are reflected in this new draft of the regulations, but there is still plenty of work to be done. Despite improvements, the updated set of rules continues to overburden and discourage diversified, direct-marketing farmers and markets. Once again, we have the opportunity to bring these concerns directly to the FDA through a public comment period. Now is our chance to shape the rules before they become law. The comment period closes on December 15th. Click here for step-by-step instructions on how to comment. FMC has worked with the National Sustainable Agriculture Coalition (NSAC) to review and analyze the two sections of FSMA rules: Standards for produce production (Produce Rule), and food safety measures for facilities that process food for human consumption (Preventive Controls Rule). FMC’s major concerns with the original proposed rules still apply: the delay in clarifying whether farmers markets are subject to the Preventive Controls Rule; the rules’ unclear definition of farms and facilities; the over-regulation of low-risk processed foods; the unclear and subjective nature of exemptions for small farms; and the excessive costs that local farmers will incur in order to adhere to new regulations. Click on the table below or read on to see what changed since the original proposed rules, and what we must ask FDA to change in order to ensure fairness for farm-direct businesses and farmers markets. Farmers markets could be directly impaired by the revised FSMA rules. When Congress wrote the FSMA law, it specified that farmers markets and other direct-to-consumer sales platforms were defined as ‘retail food establishments’ and, therefore were not subject to the Preventive Controls Rule. However, in writing the FSMA rules, the FDA has delayed clarifying whether direct-to-consumer sales such as farmers markets will be subject to FSMA regulations. Without this clarification, farmers markets could be subject to inappropriate, costly regulations designed for industrial food facilities. The FDA should release its clarification for public review before the Preventive Controls and Produce Safety rules are finalized. More information on “retail food establishments” is available here. Under the proposed FSMA regulations, farms could be subject to either the Produce Rule, the Preventive Controls Rule, or both, depending on what type of activities are taking place onsite. Although FDA has made some improvements to the definitions of “farm,” “harvesting,” “packing,” and “holding,” the rules still lack clarity regarding which activities are considered “farm” activities and when a farm may be considered a facility – and thus subject to additional regulation. For example, a group of farmers packing and holding produce at an off-farm location will be subject to many of the same regulations intended for large-scale industrial facilities. The final rules should clarify the “farm” definition to ensure that farmer operated and controlled businesses that engage in “farm” activities – like growing, harvesting, packing, or holding raw agricultural commodities — are farms, regardless of whether the “farm” activities are “on-farm” or “off-farm”. FDA should also remove the phrase “in one general physical location” from the farm definition, to reflect the modern-day reality that farms are not always contiguous, and that farms may include structures in different locations or on different parcels of land. More information on Farms vs. Facilities is available here. Home-based food businesses are explicitly exempted from registering as facilities (and thus being subject to the Preventive Controls Rule) under FSMA. In addition, some cottage food businesses who sell the majority of their products directly to an end consumer at a venue like a farm stand or farmers market may be considered “retail food establishments” and thus are also exempt from coverage under the Preventive Controls Rule. But this depends on FDA’s retail food establishment clarification (see above) and also on the farmer or food business being able to keep records that confirm their status. However, processing activities considered to be low-risk by many states (pickling, fermenting, acidifying, and baking) are not necessarily considered low-risk in FSMA. The Preventive Controls Rule will set a new regulatory floor – aka a minimum standard – nationally for these activities that could override states’ existing food safety laws. This means that as small home-based food businesses seek to scale up to meet demand (and potentially move beyond their home-based activities), they may face significantly increased regulation as they seek to expand their businesses. Value-added products are big-sellers at farmers markets—we’d hate to see fresh, local salsas and pickles disappear from our favorite markets. The FDA’s list of low-risk foods is available here. While no one is exempt from appropriate food safety efforts, direct farmer-to-consumer supply chains pose lower and different risks to the food supply. Congress recognized this fact when writing FSMA. Through the Tester-Hagan amendment, Congress required that FDA include modified requirements for direct-marketing farmers within FSMA. Unfortunately, the FDA’s rules regulating the modified requirements have failed to protect small farms in a significant way. Who qualifies for exemptions as a “de minimis” producer, and who qualifies for modified requirements? Farms with less than $25,000 in gross annual sales of produce (no longer based on sales of all food as originally proposed) over the past three years may qualify to be completely exempt from the Produce Rule. Direct-marketing farms may be eligible for modified regulations under the Produce Rule, but only if they have less than $500,000 in gross annual sales of all food over the previous three years, and sell the majority of their food directly to consumers, restaurants or grocery stores within 275 miles from their farm. If the farm is considered a facility, and must operate under the Preventive Controls Rule, it may also be eligible for the modified requirements if it can be considered a ‘very small business.’ Under the reproposed rules, a ‘very small business’ is a facility with less than $1 million in total annual sales of human food. While these exemptions are a marked improvement, qualifying for and retaining an exemption is still more complicated than it seems. When calculating gross annual sales to determine eligibility, one must include ALL produce produced—even produce not covered by the Produce Rule. Perhaps a mid-scale corn, squash or dried bean grower wants to try selling greens at the farmers market. If he moves a couple hundred thousand dollars in wholesale produce not covered by the Produce Rule, and sells a few thousand bucks of greens at a farmers market (covered by the Produce Rule), he would be expected to meet FULL Produce Rule standards on the greens, despite selling well under the amount that should be fully exempt ($25,000). This ‘all food’ distinction will discourage some farmers from diversifying their crops, and offering their communities increased access to fruits and vegetables. Another major problem is that the proposed rules give FDA broad ability to take away exemptions for farmers and facilities and subject them to the full weight of the regulations if they suspect there is a food safety problem on the farm. In the revised rules, FDA has made significant improvements to the process, including a timeline for issuing a withdrawal and a way for farmers and food businesses to regain their exempt status if it has been taken away. Yet the FDA has not defined the material conditions that might lead to a withdrawal of a farmer’s protected status. The exemptions will not be a feasible plan for protecting independent farms until the FDA defines these material conditions using scientifically measurable traits. More information on exemptions, modified requirements and the withdrawal process is available for the Produce Rule here and for the Preventive Controls Rule here. 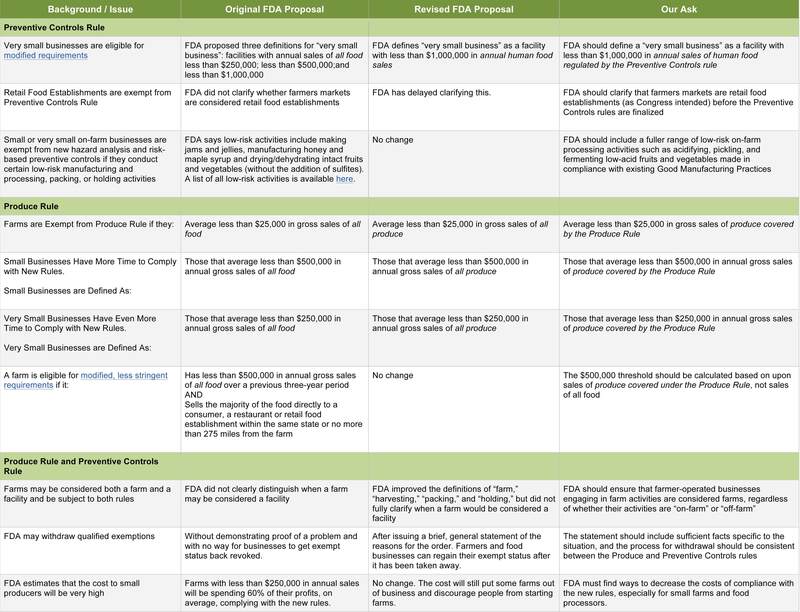 FDA’s own analysis of the cost of implementing the new rules has changed little since the original proposed rules. FDA found that very small farms (with annual sales of $25,000-$250,000) would spend six percent of their annual gross sales on testing, equipment and other compliance measures. USDA estimates that the average net farm income nationally is 10 percent of total sales. This data indicates that farms with less than $250,000 in annual sales will be spending 60% of their profits complying with the new rules. As a result of these costs, FDA anticipates that some farmers will go out of business, fewer people will start to farm, and more farmers will have to seek off-farm jobs—all of which will contribute to a stagnation in the growth of sustainable farming and local food initiatives. Specifically, regulations surrounding agricultural water quality testing will prove to be very expensive. The cost of complying with these rules will put a halt to the promising trend of new farmers getting into agriculture and into farmers markets. More information on compliance costs is available here, on NSAC’s website. The best way to fix FSMA is to comment on the rules. Whether or not you commented on the original rules, this is the most effective way to share your input with FDA. Get your comments in before the comment period ends on December 15th! FMC and NSAC have created comment templates and detailed instructions to help you get started. Farmers market managers and representatives. Vendors, farmers and food processors. Consumers and local food advocates. Please visit sustainableagriculture.net/fsma for more information on the rules.